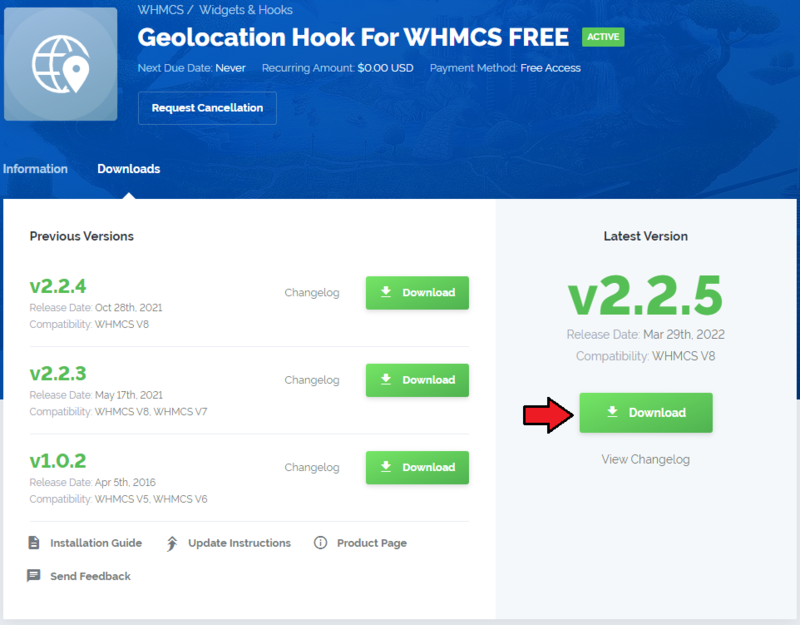 Geolocation Hook For WHMCS is a free tool allowing you to alter the currency, language, and a template of your client area basing on your clients' location. You can also specify different templates that will be used depending on the user’s device model and domain they have been redirected from to your website. Take advantage of MaxMind GeoIP2 included in the hook, or add your own submodule to detect the country from where each of your visitors is. This tutorial will show you how to successfully set up the hook. Upload the files and then move to the configuration section to learn how to take the most from it. In this tutorial we will show you how to successfully install the hook. 1. Log in to our client area and download the hook. 2. Extract the downloaded file and upload it into the main WHMCS directory. The content of the file should look like this. That is all! You do not need to install or activate it in any place! Let us procced to the hook configuration. Move to yourWHMCS/Includes/Geolocation directory and open the config.php file. Configure the file that will be called on selected pages of the client area in your WHMCS System. Underneath, you will find a detailed instruction on how to configure it step by step. 1. Define the currency and language rules. The below code snippet is responsible for assigning an appropriate currency to a client who uses pointed here language. In the example below we can see that a client who uses US language, will have a USD currency automatically turned on. You may now edit this code snippets with our own configuration and add new entries under GB example if needed. Use the same pattern to configure language for every used country. Important: Every code line must end with a comma. Do not forget to type it if you decide to add new lines. 2. Define additional template per country and language rules. We can now configure additional settings: templates per country and language rules. Assign an existing in your WHMCS system template to a country. Again, edit the exemplary code lines and add new lines if needed. Do not forget about the comma. 3. Mobile template per a mobile device. The next part is dedicated to automatic adjustment of a template based on the device that is being used to enter the client area. In case your WHCMS does not use a responsive template that will automatically adjust to the device size, you may force the template change to aone designed for such device. Uncomment the below lines and enter the existing templates names for tablets and mobiles to turn on this option. 4. Define templates per domain name. Depending on the domain name that a client enters a template will be adequately altered. Uncomment, edit and add new lines using the presented pattern. At this point we can select pages in your WHMCS where the geolocation hook should be activated. Comment any lines if you do not want to use the hook there, add other pages at the bottom. 6. Point single IP addresses. The hook will be turned off for these addresses. Uncomment, edit and add new lines using the presented pattern. 7. Point full IP pools. The hook will be turned off for the addresses in these pools. 8. Point user agents. The hook will be turned off for the enumerated here devices/browsers. full version, e.g. : 'Mozilla/5.0 (Windows NT 10.0; Win64; x64) AppleWebKit/537.36 (KHTML, like Gecko) Chrome/71.0.3578.98 Safari/537.36')'. The example below shows the integration with MaxMind GeoIP2. You may surely create your own submodule, edit the below line in such case as only one submodule can work at a time. We will use the following code to determine whether a current template is set up correctly. The system will be forced to switch the client area template depending on the chosen language. It will also work for already logged in users. Redirection needs to be executed when switching the language is done by a user or together with changing the language. If you are still not sure whether to get this product, take a look at the below screenshot to have a clear view on the hook may adapt your client area. Taking all the above into consideration we can easily say that our Geolocation Hook For WHMCS, with its automatic setup of currency and language, will allow you to smoothly adjust any offer to the individual needs of each of your client. So let's make your business even more personal! 1. You are more than welcome to visit our Blog article where you can take part in a live discussion about it. 2. In case you decide to add new lines in the config.php file below the exemplary ones provided by ModulesGarden, always remember to finish the line with a comma, otherwise your clients will encounter errors. This page was last modified on 17 January 2019, at 09:18.